While exploring the area around the North Rim of the Grand Canyon Willow and I made use of our copy of Arizona Backroads & 4-Wheel-Drive Trails to find some interesting and not too difficult offroad adventures. 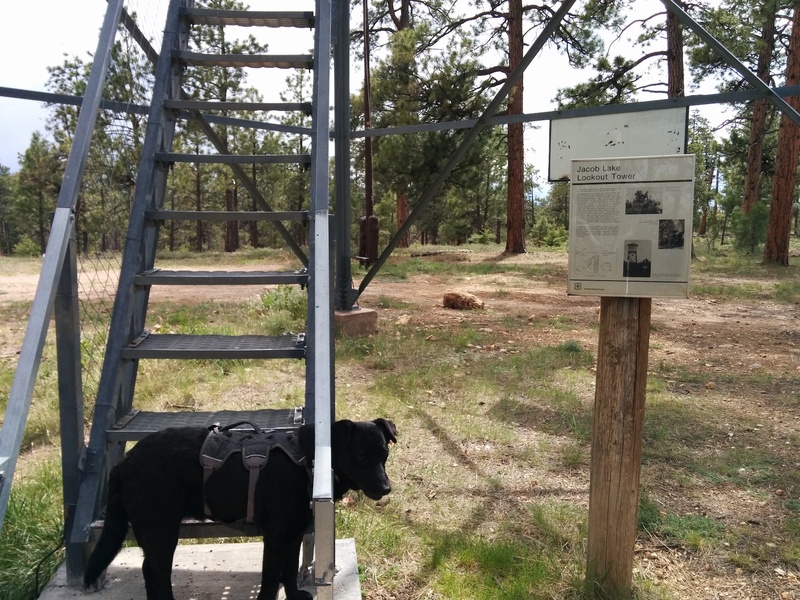 One of our favorites was a drive along some roads to the west of Hwy 67 which included visits to three different fire lookout towers, one of which I even climbed to the top of and met the gentleman performing his lookout duties. We drove the plan backwards from the way the book lays it out because we were heading back to our campsite from the North Rim and this trail’s end was close to where you exit the National Park itself. Driving away from the North Rim on Hwy 67 we turned off onto Forest Service Road 22 a little less than a mile before the North Rim Country Store. The road was typical of Forest Service roads in the area that spend half the year under the snow in freezing conditions, that is to say less-than smooth and comfortable. Doing this trip in May there were still intermittent patches of snow along the road where dark patches of shade offer protection from the sun’s rays. This also meant there were numerous sections where the road was covered with mud bogs and even icy patches that tested our Tacoma’s 4-wheel drive capabilities. With a bit of fun but not too scary slipping and sliding behind us we eventually arrived at the first lookout tower of the day, Dry Park Tower, about 10 miles since we turned off Hwy 67. 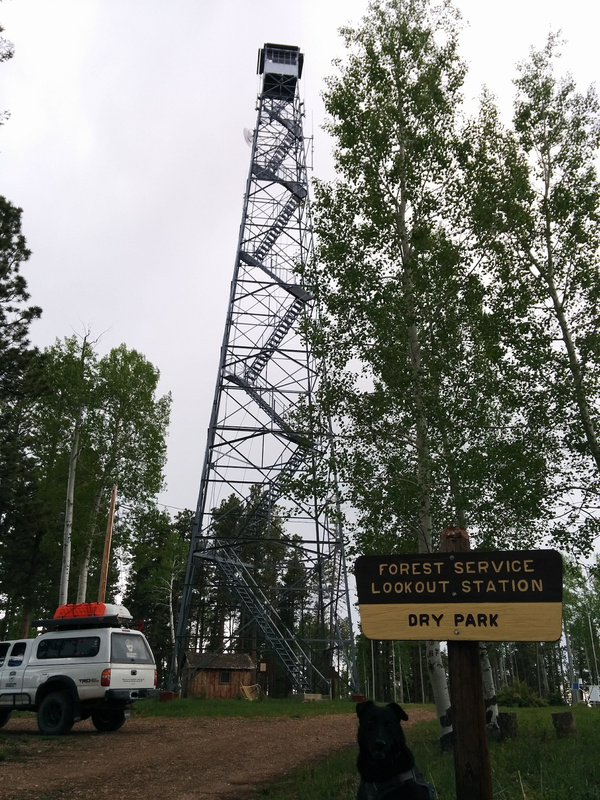 By mere coincidence the first tower we visited is also the tallest in the whole Kaibab National Forest at 120′ tall. Built in 1944 the tower is an Aermotor design from the same famous windmill company. Sadly, as we had been driving to this tower the weather had decided to turn threatening with light rain showers and thunder and lightning. 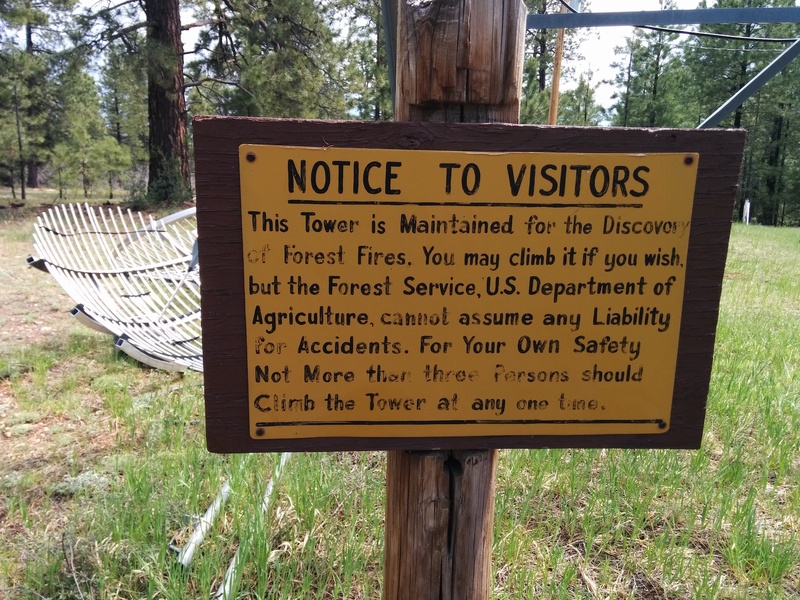 As we pulled up, got out and looked around the woman manning the tower leaned out and kindly suggested that, normally we would be welcome to come up and take a look, but now would probably not be a good time to walk up a 120′ metal tower. With thunder rolling directly overhead and lightning strikes nearby we agreed with her assessment and decided not to risk, you know, death by electrocution. While towers like these are well grounded I am under the impression that, in the case of a lightning strike, the grounding allows the electrical charge to travel through the metal structure and into the ground below while protecting the occupant in the wooden building at the top. Standing on and holding onto the tower during a lightning strike would be a bad thing. I also might not know what I am talking about as electricity is scary BlackMagicFuckery to me. With the rain increasing we looked/sniffed around for only a couple more minutes and then decided to head on to the next tower on our list. About 14 miles further up Forest Road 22 we at first missed the turn off since we were reading the trail and mileage points backwards. 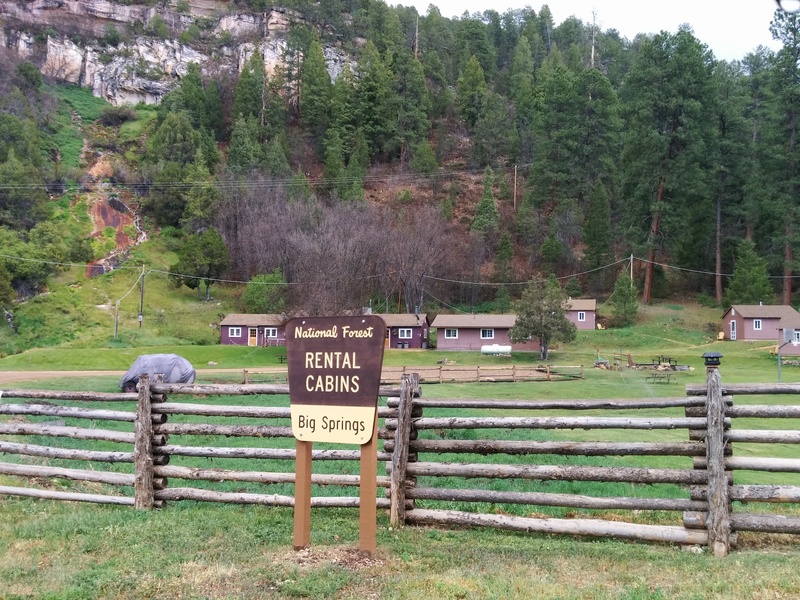 As soon as we arrived at the Big Springs Field Station with its rental cabins we knew we had gone just a bit too far and turned around to get back on the right path. After our about-face we turned off onto FS 429 as per the book’s directions. 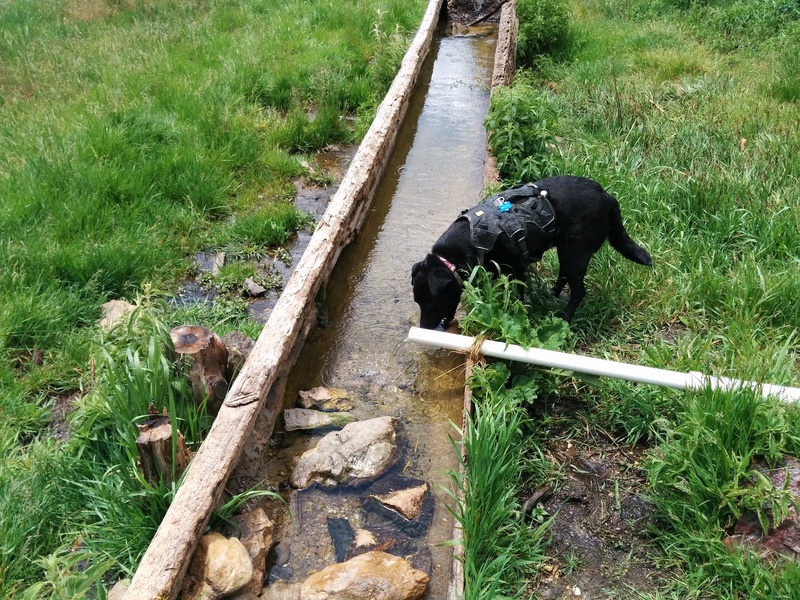 All of a half mile later we came to the Castle Springs Corral and got out to take a look at let Willow get a drink. A couple of dozen yards back up past the trough we squeezed through a wooden barrier designed to keep any wandering cows from getting into the springs and walked back under the large rock overhang to the springs themselves. After our quick stop we drove back onto Forest Road 429 getting ever closer to our next tower. Throughout our drive we regularly came across cattle right at the side of the road contentedly grazing and enjoying their life. A few times we had to quickly slow to a crawl through a section of road so as not to spook or possibly hit one of those large, easily-capable-of-denting-our-Tacoma meat sacks. 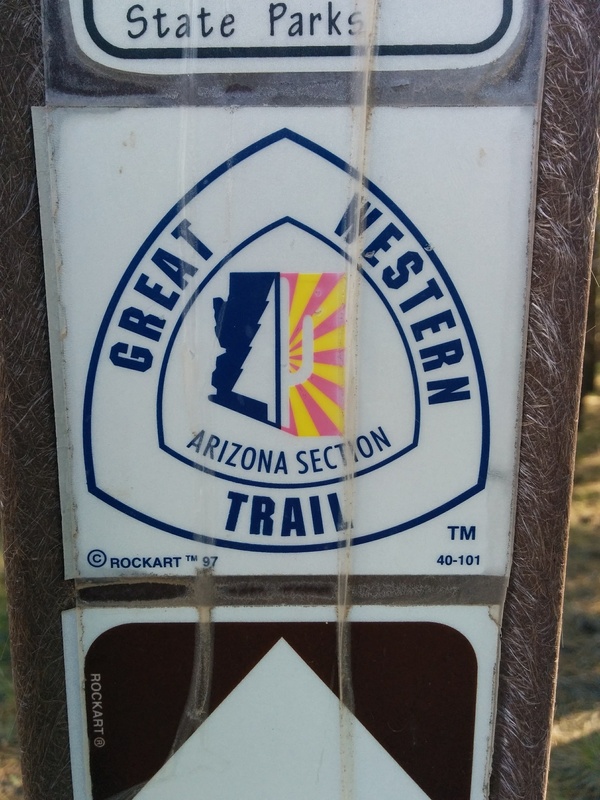 Several times throughout the day we came across roadside markers indicating that we were traveling along parts of the Great Western Trail. Another 5 miles or so down the road our next turn-off beckoned and we made a hard left onto FS 454. 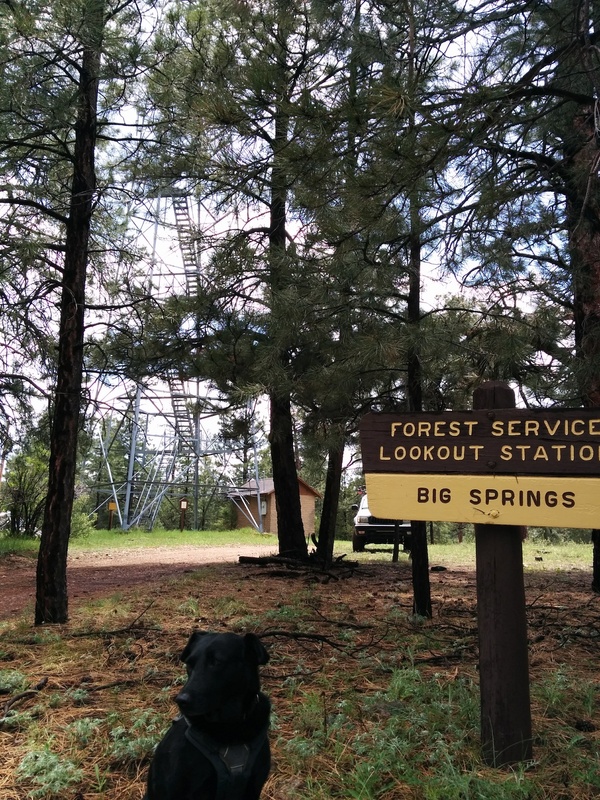 Four more miles up the Forest Service road with another few sections of tricky, slippery mud to contend with we emerged through the trees and saw the Big Springs Lookout Tower rise above us. When we pulled up a young girl came out of the cabin a few dozen yards away and squealed with delight as Willow ran up to greet her. The metal, roughly-knobbed stairs looked exceedingly uncomfortable for my girl’s delicate Princess paws and the 133 steps would have wrecked havoc on her back so I asked the girl if she minded if I went up the tower and left Willow down below with her and she happily agreed. So, up I went and was immediately blasted with the pre-storm winds swirling along the top of the mountain. The higher I got the stronger the winds. At several of the stair switchbacks I was forced to use both hands for stability and remove my hat or I would have had to find it down below and far away after I came back down. Those 133 stairs amounted to a 100′ tower. Like the Dry Park tower this too was a kit from the Aermotor Company. 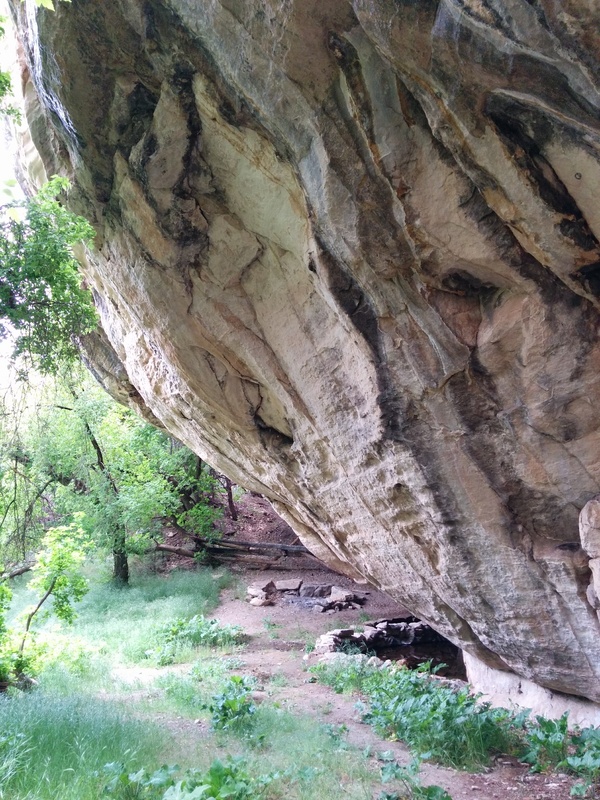 It was constructed in 1934 and is now listed on the National Register of Historic Places. I was met by a closed horizontal door above my head when I reached the top of the stairs. After giving a polite knock a voice from inside invited me to “come on up” and helpful hands assisted as I pushed up on the heavy door. Once I was completely inside we closed the door to minimize the wind noise and I formally introduced myself to the friendly and informative gentleman manning the tower. In the interests of his privacy I will not publish his name but he was genuinely a nice man and seemingly happy to answer all my questions which we assume he has heard and answered thousands of times before. His story was interesting as well in that he has done this job for 18 years and took over from his mother who had done this job before him in this same tower for 51 years! I mentioned that Willow was down below playing with a nice girl and he confirmed that was his granddaughter who was visiting for the week. 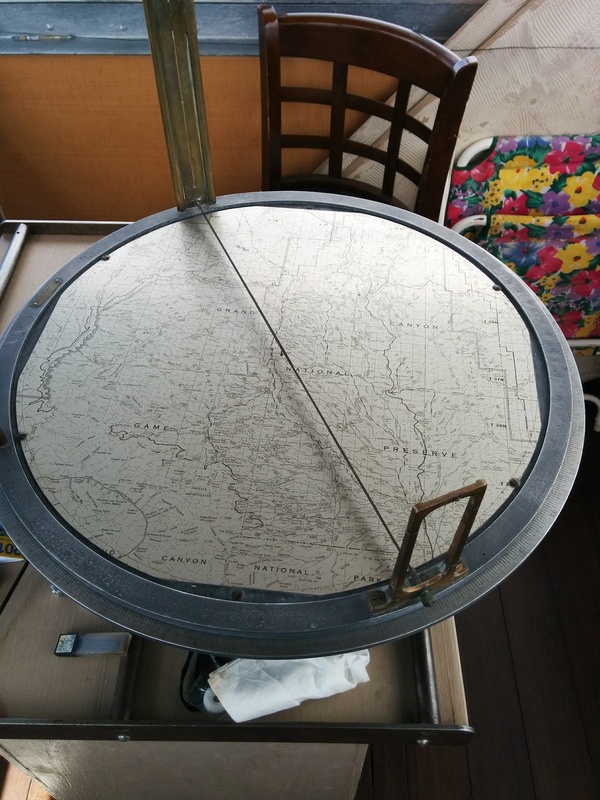 The center of the lookout is taken up by a large, flat table with an old contraption on it. 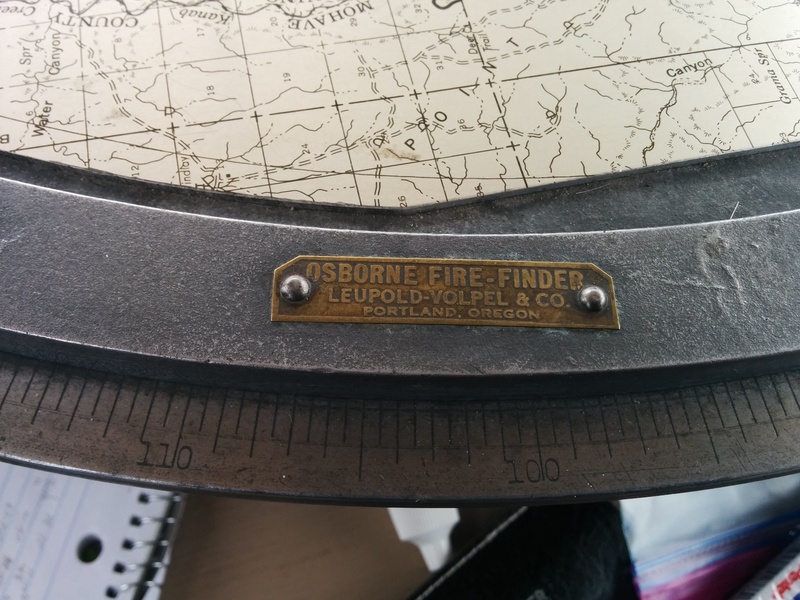 This is the simple but effective Osborne Fire Finder. Invented by William Bushnell Osborne, Jr. between 1910-1911 it was so well received in the forest fire fighting community that it went into production in 1913 and was in wide use by 1915. Our host atop this tower explained how his unit worked, how to use it (388KB pdf) and he even had an opportunity to actually put it to use after he swept the surrounding area with binoculars, saw something of interest, took a sighting/reading through the Osborne and called the forest’s headquarters to confirm his sighting with the other lookouts in the area. This sighting ended up not being a fire but, if I remember correctly, he said he has reported, on average, 3 to 7 sightings a month with over 100 in one particularly active year. We have since found a small (508KB), 4-page pdf document online of interest to us called History of the Osborne Fire Finder. Not wanting to take up too much of his time or focus we thanked him for allowing the visit, wished him a good day and headed back down the 133 stairs to my girl who actually was too wrapped up playing with the child to notice or even care that much about my return. So, now back down on solid ground with the weather clearing a bit we headed off towards the end of this route in the town of Jacob Lake, the next stop in our day’s adventure. On our way there we encountered a bit more mud (Yay! 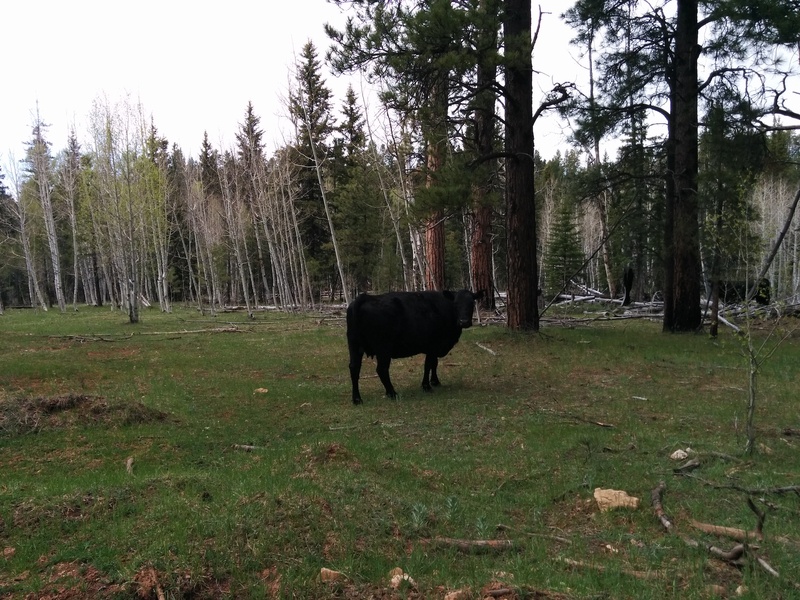 ), more cows stomping around in the road (Bad cows, Bad!) and eventually emerged from the forest into a wide clearing with a pond on the left of us and an old cabin-type structure on the right. 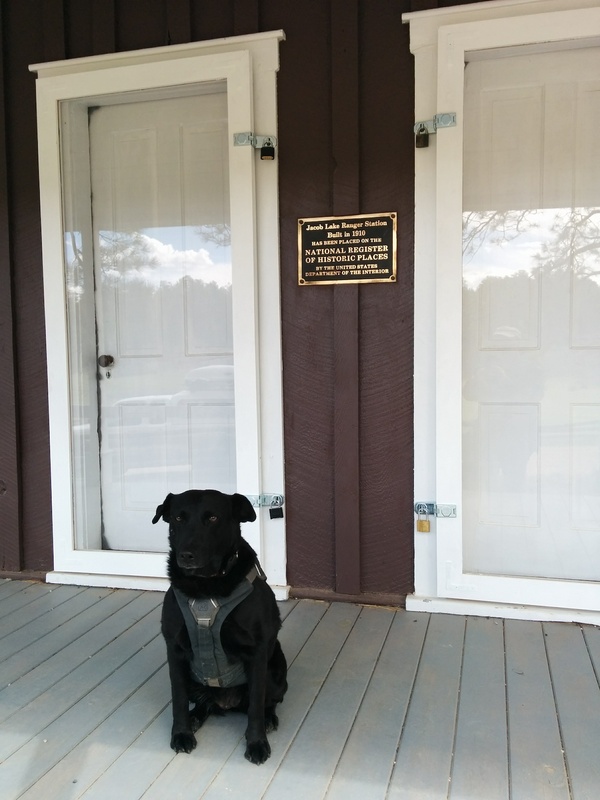 The building happened to be the historic Jacob Lake Ranger Station. 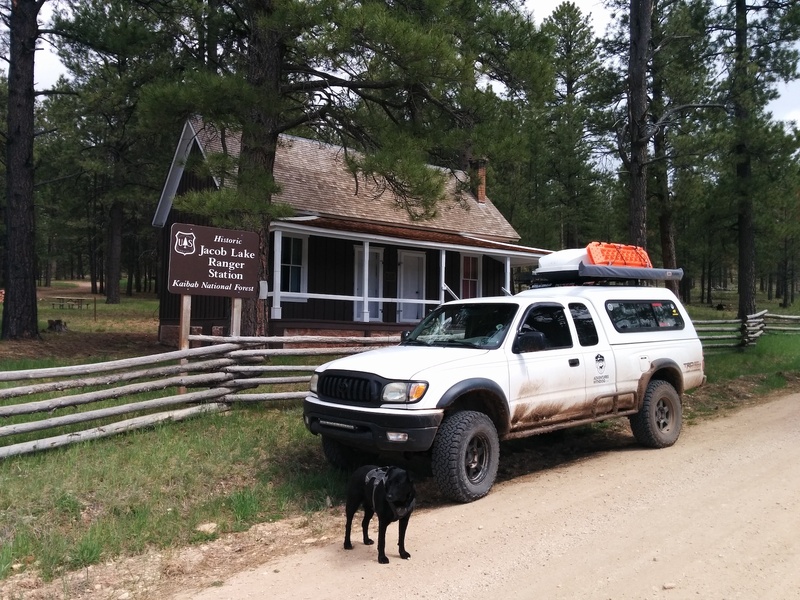 Built in 1910 this was one of the main official contact point for visitors to the National Forest until the new, modern Kaibab Plateau Visitor Center next to the Jacob Lake Inn was built. 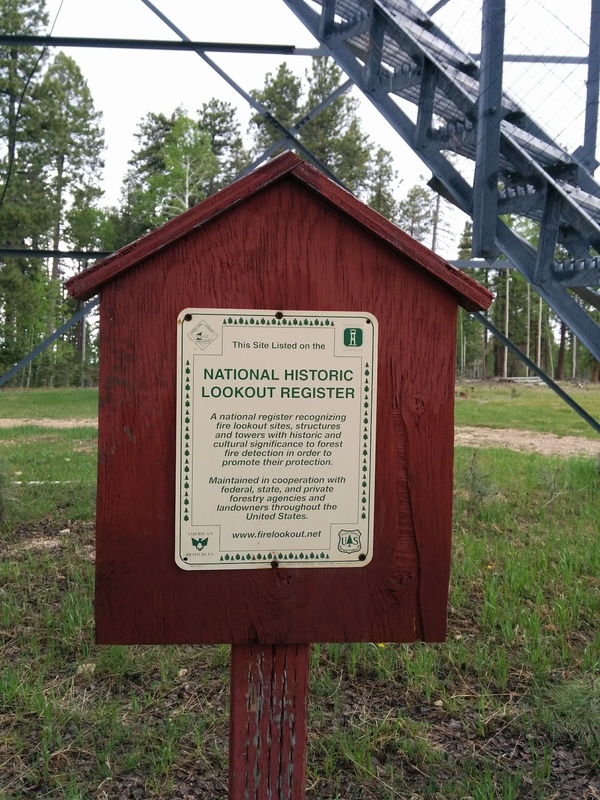 By 1911 there were six of these buildings placed throughout the Kaibab National Forest. Today this is the only one left standing. 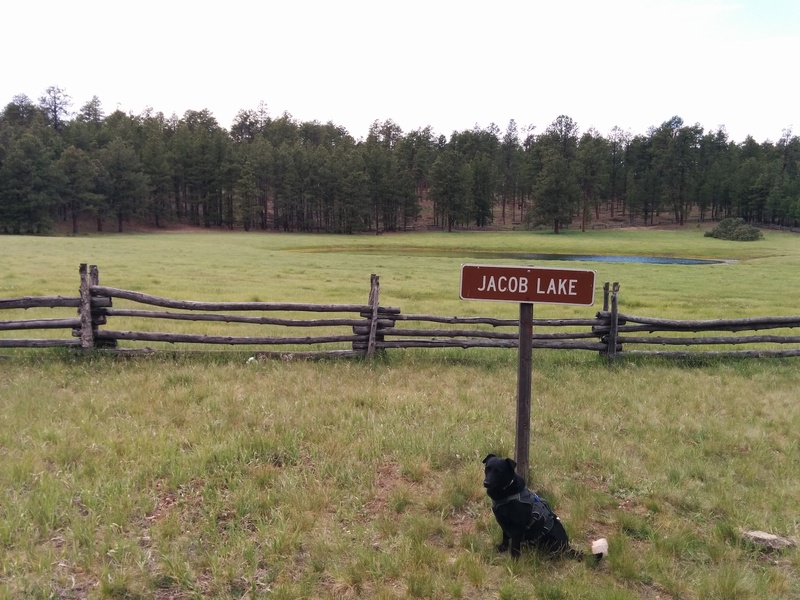 Directly across the road from the old Ranger Station is Jacob Lake itself. More of a pond really it is privately owned and so we, with some difficulty, suppressed our desire to hop the little wooden fence and explore the area. Just a bit over a mile from the “lake” and the Historic Cabin and back out towards Hwy 67 we essentially crossed the highway on the diagonal from the Forest Service Road onto the access driveway to the third Lookout tower of the day. This was the Jacob Lake Lookout Tower and, at 80 feet, is the shortest of the three towers we had visited this day. Due to budget constraints the usual scenario is that two of these three towers are manned on any day with which ones being manned left up to the Fire Spotters and their supervisor. Today this was the unmanned tower. 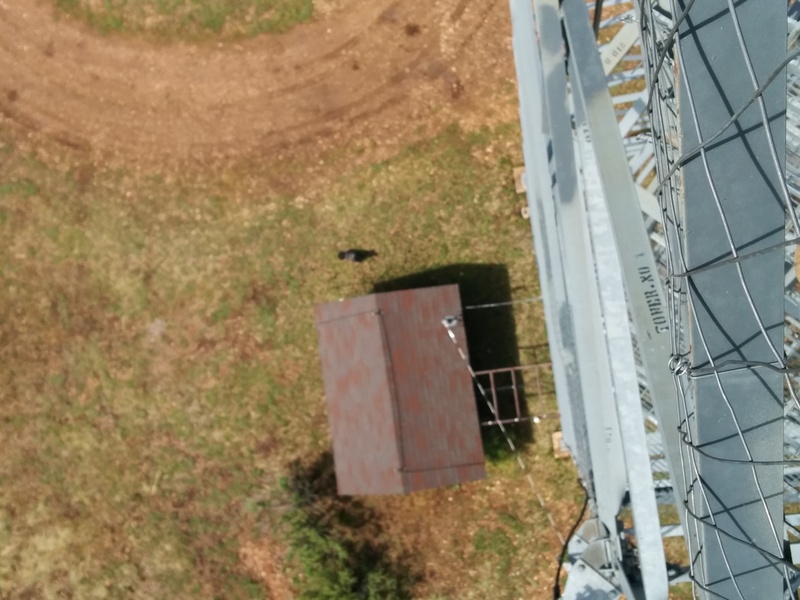 Since the door to the actual lookout on the top of the tower would have been locked we decided to forgo that climb and instead enjoy the view from below. There is a small display of lookout tower history which is still mostly readable even after the douche attentions of vandals. From these displays we learned a bit history of the fire lookout with particular emphasis as it applies to the North Kaibab Plateau. Now that we were back in Jacob Lake our dispersed campsite was only a few more miles down the road and so we started the 10 minute drive back so that we could relax and prepare dinner after the long day’s adventure. 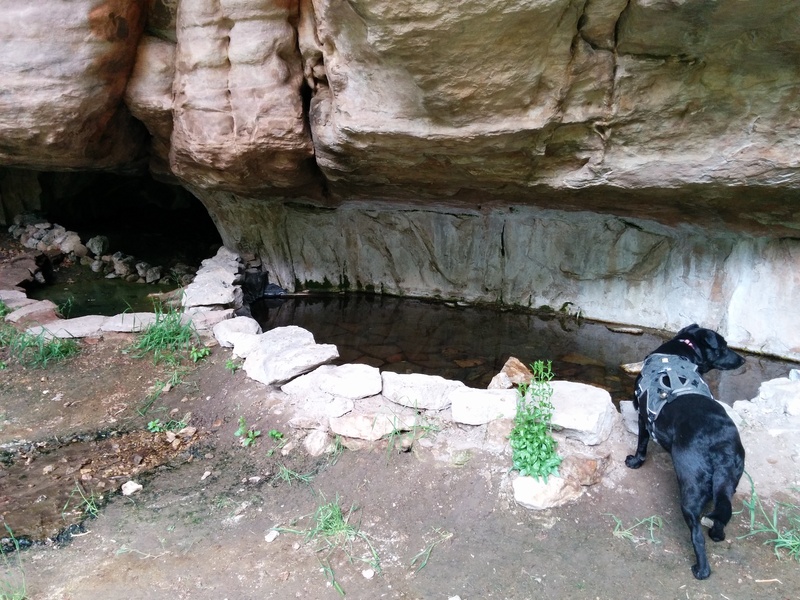 We had not done miles of hiking but I had done several hundred vertical feet of up and down, Willow had run around sniffing to her heart’s content while waiting for me to come back down (kinda) and 60 miles on slippery dirt roads is tiring in and of itself. 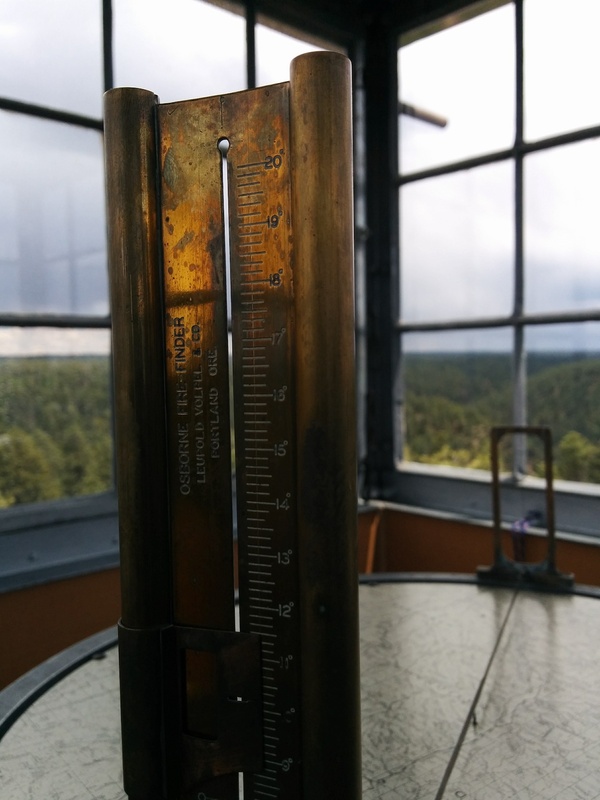 In our travels we’ve come across many lookout towers and sometimes even gotten inside them but this was the first time we were given a tour and shown how the equipment works. Fun and interesting stuff. Sadly getting up the metal stairs is not something that Willow can/should do nor should anyone else with bad knees, a bad heart, bad lungs or a general fear of heights attempt these climbs. For people with a love of forests, history or an interest in wilderness firefighting this was a relatively easy route with lots to offer. Our total mileage for this adventure was a little under 60 and you would add about 30 more if you started at the “official” beginning in Jacob Lake and then had to drive back up Hwy 67. The North Rim of the Grand Canyon was our main destination while we were in this area but our backroads and 4×4 trails book gave us the opportunity to explore areas that you just don’t get to see from a paved highway. 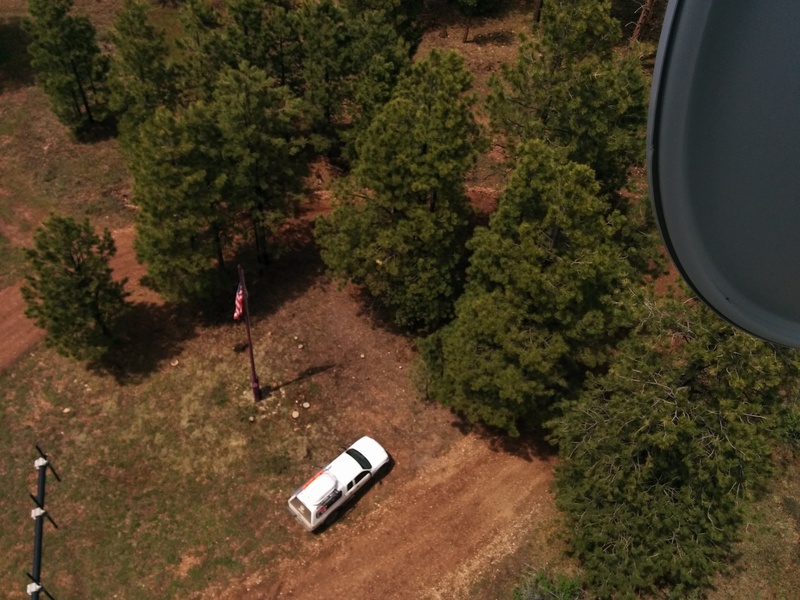 This chance to truly experience these three fire lookouts was well worth the slight extra effort on our part and we would urge you to experience this easy adventure for yourself if you find yourself in the area. Keep your tires below your roof (if at all possible).